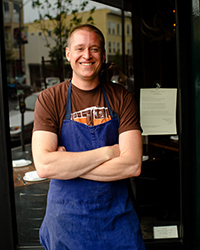 In the late 2000s, Michigan-born Nick Balla was known as the inventive chef behind some of San Francisco’s best Japanese restaurants. Then a move to Bar Tartine gave him the opportunity to explore a cuisine of his past: the Hungarian food he loved during his teen years in Budapest. Today, Balla channels his zeal for both Asian and Central European flavors into Bar Tartine’s thoughtful menu. The chef talks with Food & Wine about the definitive Hungarian cookbook, Japanese steel and probiotic grains. Our chopped salad is based on something that my dad used to make that has Hungarian roots. It usually just contains meat, cheese and chopped up vegetables. Our current version has aged pepper Jack cheese that my girlfriend and co-chef, Cortney Burns, makes for the restaurant, homemade salami, yogurt, paprika, kohlrabi, romanesco florets, raw red onion, sprouted mung beans and black garbanzos. We dress it with a vinaigrette, and you eat it with a spoon and good bread for dipping. Tataki is a Japanese dish, but we tailored it so it makes sense with our Central European menu. It’s beef that’s seared on the outside but raw in the middle, and instead of seasoning it with soy sauce, we cook beer down with kombu [seaweed] and add citrus and katsuobushi (smoked skipjack tuna). Then there’s our fisherman’s stew, which is a staple. Freshwater fish soup is one of the most popular dishes in Hungary, so we tried to re-create its flavors. The broth’s base is usually carp cooked with onions and paprika, but we make ours with sturgeon and green New Mexico Hatch chiles. We add mushrooms, collard greens and plenty of onion and garlic, so you get this really earthy, green chile-spiced broth. George Lang’s The Cuisine of Hungary is an incredible piece of writing. The first 150 pages are a history of Hungarian cuisine, and then it moves into simple versions of all of the most well-known dishes. It’s just a legendary book and he was a legendary person. He died a couple of years ago. His family has actually been coming to eat at our restaurant, which is really cool. I wish I could have met him. Brining is a supersimple thing that can be done without measuring anything. It really is the most effective way to get flavor inside a piece of meat or a vegetable. Taste the brine to make sure it’s properly seasoned, and you can’t mess it up. Onion is one of our favorite things. We make a number of different onion powders at the restaurant: a smoked onion powder, a roasted onion powder and a straight white onion powder. We also use a lot of raw onion, and we add it to our broths to add a layer of umami and sweetness. Fermented beverages are going to get big. Cortney makes a water-based kefir for our taps using probiotic kefir grains. They are strong enough to ferment water and sugar overnight. It’s incredibly healthy—healthier than kombucha—and very delicious. She also makes milk kefirs that we use for ice cream and cultured butter. I think chefs will start to use that stuff the way they would use yogurt in a dish. A sixth-generation knife maker in Japan built me a blade to fit my hand. He took a sketch of my palm and made it specifically for me. It’s a huge chef-style knife made with carbon steel. Right now it’s all about Chinese greens. I’m interested in different choi varieties and garlic chives, too. I’m eating them very simply—roasted or steamed with chile oil. Trader Joe’s Thai lime and chili cashews are covered in this ultra-addictive spicy seasoning. They’re like crack.